Spaces with a big flow of people must use wooden elements treated with fire-resistant coatings. These structures are classified as A (low risk, e.g. shop), B (medium risk, e.g. place of worship) or C (high risk, e.g. school) depending on the risk of fire and the quantity of people. After the risk assessment, designers and builders must adopt one or more measures aimed at reducing the probability of fires. 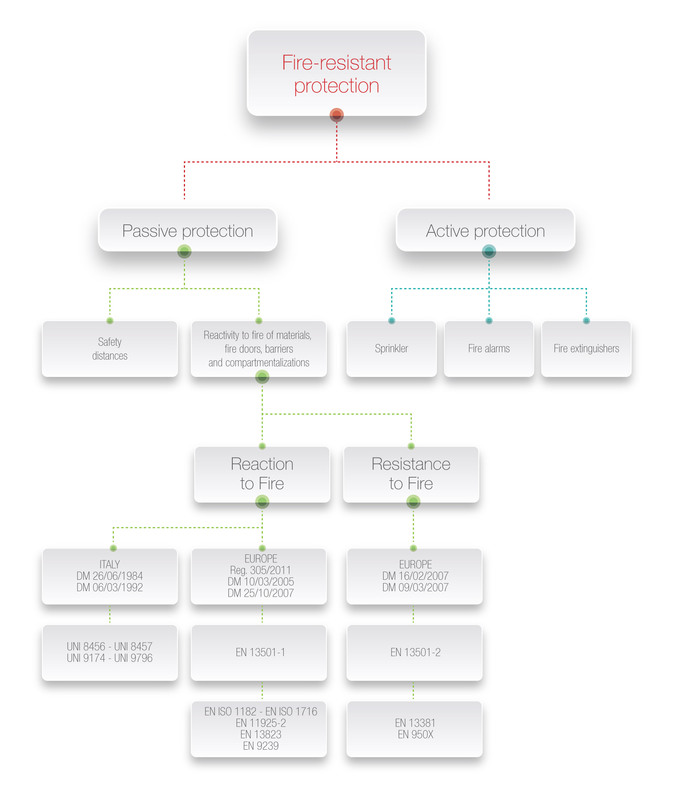 These measures apply active protection and passive protection. E.g. sprinklers, fire extinguishers, emergency exits, evacuators, smoke detectors, etc. They are aimed at reducing the effects of fire, by slowing down the spread of fire and the development of smokes without human intervention. E.g. fire-resistant and intumescent coatings, plasters, slabs, fire doors, etc. A specific Class of Resistance or Reaction to Fire is required for each item made of material, classifiable as passive protection. The Resistance to Fire is a feature of structural elements, compartments or fire doors. The Reaction to Fire is a feature of wall coverings and furnishings.